I’m an affable kind of guy, I don’t want for much and I generally feel quite content. Put me in front of a roaring fire with some decent food, a nice bottle of wine and leave me. I will be more than happy. At the weekend take me out for a wander along a beach or to grab a coffee and a look around the shops and I feel equally at ease. Which is fortunate as my wife is also very keen on both, perhaps leaning a bit more towards the retail spectrum as the winter approaches. So imagine the scene, there I am poking about in various shops (books and clothing mainly) and just about ready for a visit to Starbucks when I am stopped in my tracks by a window display. I was lost. 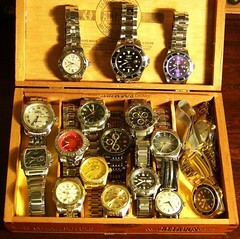 You see I am addicted to watches. Big ones, small ones, cheap ones and some not so cheap, I just love them. Which is why you should never leave me alone too long in a shopping environment. (I also love jackets but at least there is a single-minded aim there – to find the ultimate jacket – something I have come close to on a number of occasions and a vice which is then largely under control for the moment).But watches on the other hand are always there, singing their siren song on web, in stores, brochure, magazines and newspapers. Men don’t really wear a lot of jewellery and a watch provides us with a bit of individuality. They are also my favourite accessory, I have daily work watches, weekend watches, I even have evening watches. I have straps of rubber and straps of titanium, stainless steel and plain old canvas. Traditional watches, digital affairs, G-shock, diver, military, surfing, chronograph and LCD. All shouting “pick me, pick me”. I have been known to buy a watch instead of food and go hungry in earlier years, I’ve also found myself hanging around the same jewellery store week after week gaping at a particular prize and desperately fighting the inner voices that want me to get “the preciousss, get it now”. My favourite watch is probably a Breitling Avenger Seawolf with a yellow face, which at over £2500 is not on my Christmas list. For the smaller budget there is a bit of a look alike called the CX Swiss Military Watch SEAWOLF I Scuba NERO which retails for about £450. But to be honest I enjoy wearing different watches so much that I just can’t bear to spend that level of money on something that doesn’t involve a plane and a passport. So with feet firmly on the ground my latest object of desire is a Tokyoflash Kisai Maze Watch which disguises the time in the spaces of a LCD maze, making it very difficult to the untrained eye to read, but easy for the end-user. I mean how cool is that? It is also a more palatable £87 and is water-resistant to 3ATM’s (whew). 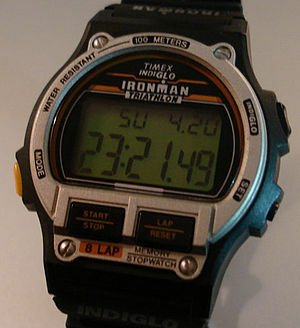 I’m also quite taken with the Timex Ironman watch, which was on special offer during the Amazon Black Friday sale. An absolute bargain at £20 against the normal £65 price tag. Similar in many ways to the Casio G-Shock but if anything slightly more rugged. Sadly I missed out this time but will keep looking! I’ve making every effort not to feed my addiction, but I did recently purchase two watches from Avon (long story), one which I love and one which I prefer not to talk about. So with Christmas just around the corner I really don’t know what is going to happen, but if you feel the need to intervene just remember that I want the silver strap and the blue face please. Watch this space (if you pardon the pun).